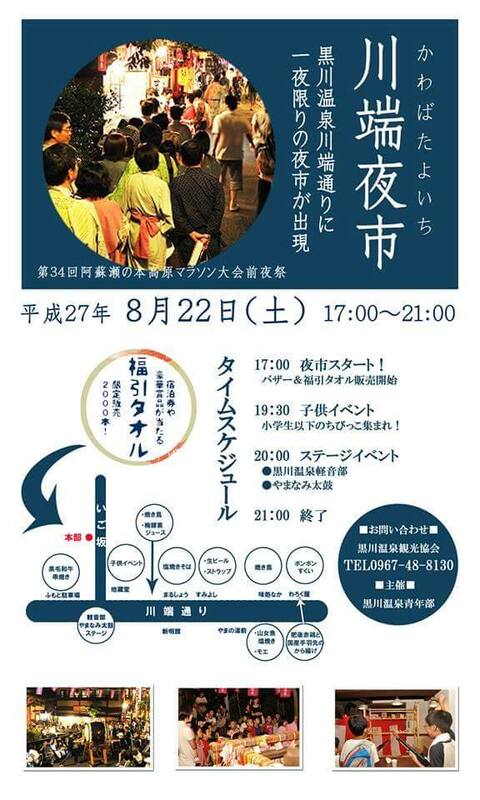 The `Kawabata Yoichi` a small yet lively evening fair takes place along Kawabata -Dori in the center of Kurokawa on the evening of Saturday,August 22nd,so come and join in if you happen to be staying in the area. From 5pm the various food and drink stalls along the street are open, with a lucky draw throughout the evening (even if you don`t purchase a winning ticket you can get a free towel!) At 7:30pm there are events planned for younger children,and from 8pm music and Japanese drumming . The festivities draw to a close at 9pm. Japanese poster follows. Please phone the Tourist Center on 0967-48-8130 for further details (some English spoken).